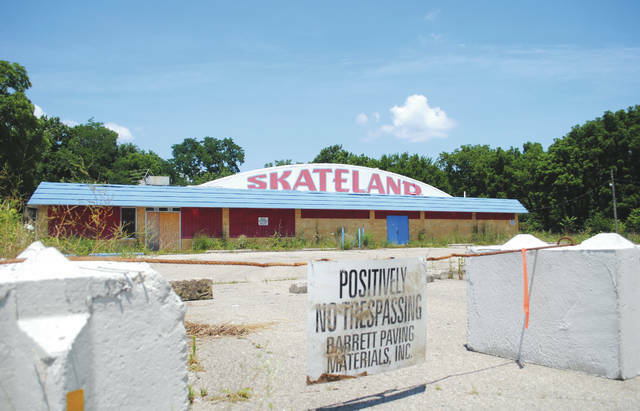 Whitney Vickers | Greene County News The land where the Skyborn Drive-in and Skyborn Skateland sit was rezoned in the spring months and currently belongs to Barrett Paving Materials. The company has agreed to work with the Fairborn Area Historical Society to allow them to explore and collect historical items of interest before the area is mined. 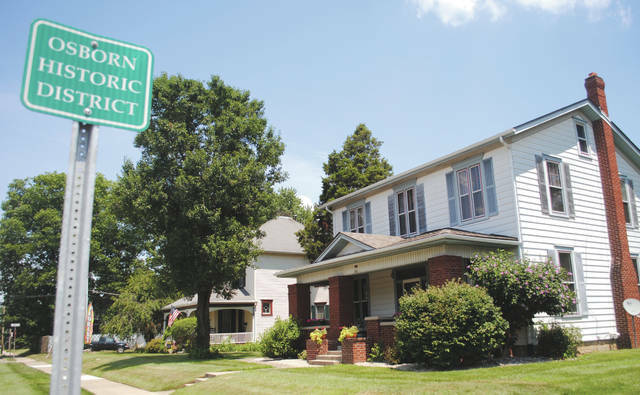 Whitney Vickers | Greene County News From 1920 through 1950, homes were removed and transported from Osborn to areas near Wright Avenue, Pleasant Drive, Main Street and the lots near the Fairborn Senior Apartments on Central Avenue. 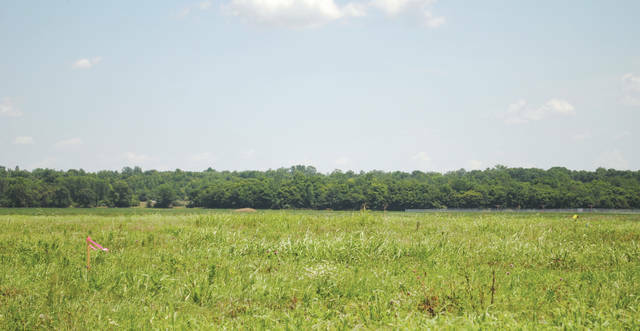 Whitney Vickers | Greene County News The National Parks Service’s Midwest Regional Archaeology Center has been surveying areas of Old Osborn including Haddix Road, where the former Skyborn Theatre and Fairborn Skateland are located, as well as the land near Cox Cemetery. Pictured is Haddix Road. Whitney Vickers | Greene County News A stake (bottom left corner of photo) in the field across from Fairborn Skateland. 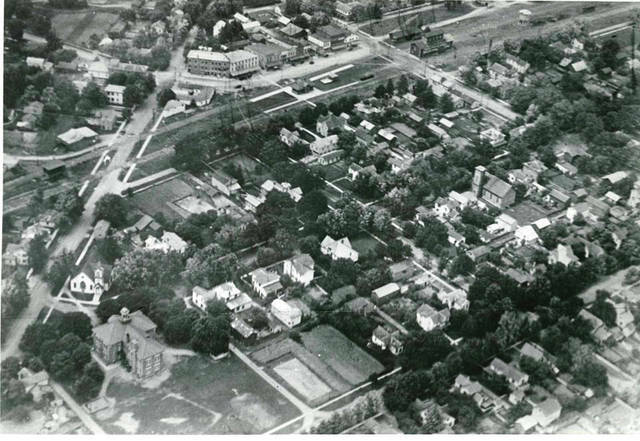 Submitted photo An aerial photo of Old Osborn provided by the Fairborn Area Historical Society. FAIRBORN — The National Parks Service’s Midwest Regional Archaeology Center has been surveying areas of Old Osborn and will later compare findings to aerial photographs and maps. 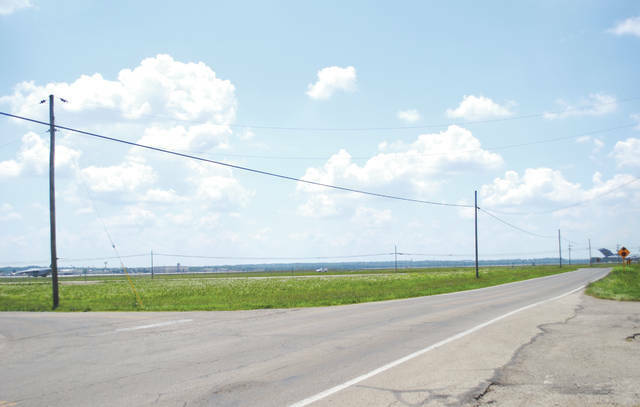 Surveyed areas include Haddix Road, where the former Skyborn Theatre and Fairborn Skateland are located, as well as the land near Cox Cemetery. Preliminary results, according to Adam Wiewel of the National Parks Service, indicate former locations of homes, utilities, streets, wells, a railroad track segment and sidewalks. While project officials have left the area due to high temperatures, Wiewel added that more work remains. Crews pressed “pause” on the project for now and will return in the cooler fall months to complete the investigation. Paul Woodruff of Wright-Patterson Air Force Base said the findings will be posted next year. “We use a suit of instruments, including magnetic gradiometry, ground-penetrating radar, earth resistance and electromagnetic induction that are capable of detecting subsurface archaeological features,” Wiewal wrote in an email to Baugh. After the Great Dayton Flood of 1913, five dams were put in place throughout the Miami Valley. The Village of Osborn would have been in a floodplain if one of the dams were to be lifted. The fate of Osborn was to either be torn down, moved or destroyed if another flood were to devastate the area. As a result, the Osborn Removal Company was created and sparked a local controversy while the homes were shifted to the neighboring Village of Fairfield located along what is now known as Broad Street. From 1920 through 1950, homes were removed and transported from Osborn to areas near Wright Avenue, Pleasant Drive, Main Street and the lots near the Fairborn Senior Apartments on Central Avenue. During that 30 year period, villagers from both Osborn and Fairfield coexisted but had two of everything — two police departments, two post offices and more — which led to financial distress and the decision to merge the two villages together in 1950, thus creating Fairborn. The land where the Skyborn Drive-in and Skyborn Skateland sit was rezoned in the spring months and currently belongs to Barrett Paving Materials. The company has agreed to work with the Fairborn Area Historical Society to allow them to explore and collect historical items of interest before the area is mined. Findings of the survey will be compared to plat and Sanborn maps as well as aerial historical photographs from archives found at the Fairborn Area Historical Society, Wright-Patterson Air Force Base, Wright State University Special Collections, Dayton Metro Library, the Xenia Community Library, Greene County Recorder’s Office, Greene County Archives and the Greene County Historical Society. https://www.fairborndailyherald.com/wp-content/uploads/sites/50/2018/07/web1_osbornsurvey4.jpgWhitney Vickers | Greene County News The land where the Skyborn Drive-in and Skyborn Skateland sit was rezoned in the spring months and currently belongs to Barrett Paving Materials. The company has agreed to work with the Fairborn Area Historical Society to allow them to explore and collect historical items of interest before the area is mined. https://www.fairborndailyherald.com/wp-content/uploads/sites/50/2018/07/web1_osbornsurvey1.jpgWhitney Vickers | Greene County News From 1920 through 1950, homes were removed and transported from Osborn to areas near Wright Avenue, Pleasant Drive, Main Street and the lots near the Fairborn Senior Apartments on Central Avenue. https://www.fairborndailyherald.com/wp-content/uploads/sites/50/2018/07/web1_osbornsurvey2.jpgWhitney Vickers | Greene County News The National Parks Service’s Midwest Regional Archaeology Center has been surveying areas of Old Osborn including Haddix Road, where the former Skyborn Theatre and Fairborn Skateland are located, as well as the land near Cox Cemetery. Pictured is Haddix Road. https://www.fairborndailyherald.com/wp-content/uploads/sites/50/2018/07/web1_osbornsurvey3.jpgWhitney Vickers | Greene County News A stake (bottom left corner of photo) in the field across from Fairborn Skateland. https://www.fairborndailyherald.com/wp-content/uploads/sites/50/2018/07/web1_historyoldosborn.jpgSubmitted photo An aerial photo of Old Osborn provided by the Fairborn Area Historical Society.